1. Mamihlapinatapei (Yagan, an indigenous language of Tierra del Fuego): The wordless yet meaningful look shared by two people who desire to initiate something, but are both reluctant to start. 2. 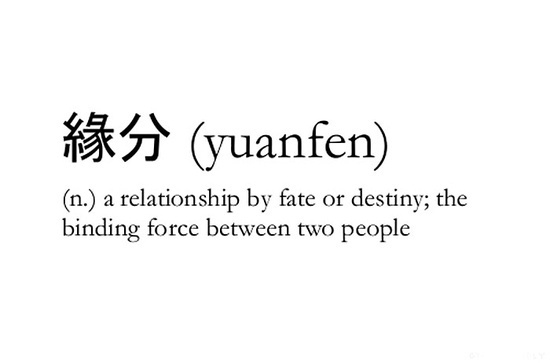 Yuanfen (Chinese): A relationship by fate or destiny. This is a complex concept. It draws on principles of predetermination in Chinese culture, which dictate relationships, encounters and affinities, mostly among lovers and friends. 3. Cafuné (Brazilian Portuguese): The act of tenderly running your fingers through someone’s hair. 4. Retrouvailles (French): The happiness of meeting again after a long time. 5. Ilunga (Bantu): A person who is willing to forgive abuse the first time; tolerate it the second time, but never a third time. 6. La Douleur Exquise (French): The heart-wrenching pain of wanting someone you can’t have.